Staff Fest, the annual appreciation event for Emory’s staff, celebrates 40 years this year, entertaining employees since 1978. To recognize this milestone, activities for this Friday’s event will feature a 1970s vibe. A disc jockey will play ‘70s music and there will be dancing on the Quad. Groovy tie-dye Staff Fest t-shirts will be available for $10, while supplies last. The main Staff Fest event is Friday from 11:30 a.m. to 2:30 p.m. on the Quad, where, in addition to the music, there will be games, activities and food. With rain in the forecast, attendees are encouraged to bring an umbrella or poncho. If weather turns severe and requires changes to Staff Fest activities, employees will be notified via email. Lunch will be served promptly at 11:30 a.m. Jim 'N Nicks will cater and the menu includes chopped beef brisket or pulled chicken, barbeque baked beans, potato salad, cheddar biscuits, fresh fruit and a small dessert. The vegetarian option is a choice of a portobello mushroom sandwich or a black bean burger. No badges or meal tickets are needed. Attendees receive one meal per person only; no pickups for co-workers and no extra “to-go” meals will be permitted. An assortment of beverages from Coca-Cola, a Staff Fest sponsor, will be available. Popcorn and ice cream will also be available at stands on the Quad. Staff Fest will also feature face painting, caricature drawings, green screen photos, a rock wall, basketball hoop, relay races, supersized Twister, corn hole and more. Attendees are encouraged to bring their own reusable water bottles. Not only does this support Emory's sustainability goals, but it also offers participants the opportunity to win a prize. Employees can show their water bottles to a Sustainability staff member and be entered into a drawing for a grand prize. 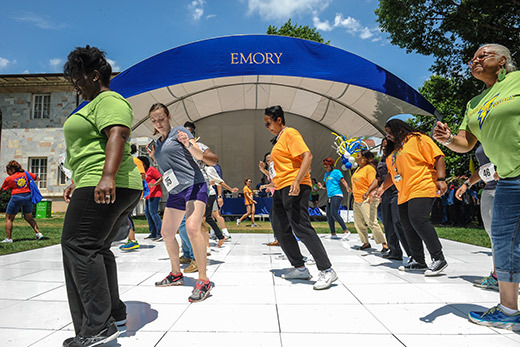 Employees are reminded that Staff Fest is for current Emory University staff and retirees only. Family members and others will not be admitted. Two popular annual Staff Fest events get started before the 11:30 a.m. main event. The annual Fun Run/Walk starts at 10:30 a.m. at Asbury Circle. Registration opens at 9:30 a.m. and check-in is by 10:15 a.m. The two-mile run/walk is on campus and ends on the Quad where Staff Fest festivities take place. Those who can’t join the run/walk are encouraged to come out and support their co-workers. Prizes will be awarded for various age groups. The 2018 Staff Fest Volleyball Tournament will take place from 10:30 a.m. until 2 p.m. This action-packed, highly competitive contest features refereed games on two courts on the Quad.